When celebrating the holidays, you want to serve up something really special. This Hanukkah, dress up your table with a spread of heavenly desserts. Your family and friends will be asking for seconds—and the recipe! 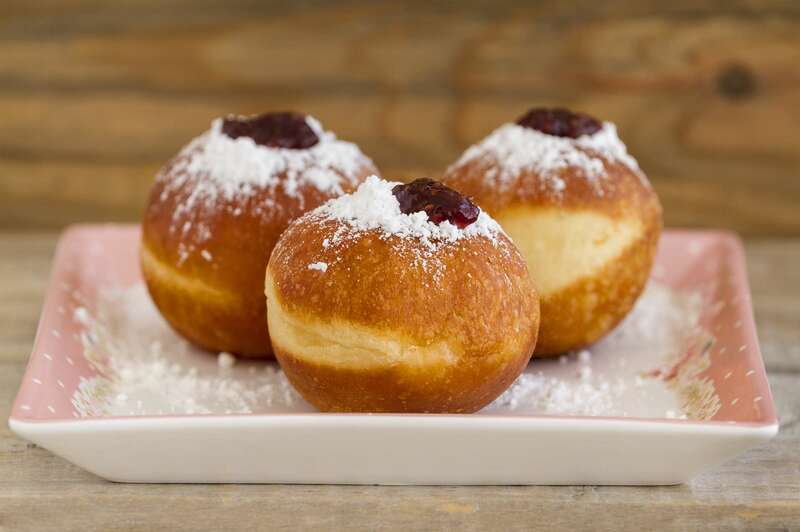 Yes, you can make your own sufganiyot, the deep-fried jelly donuts traditionally eaten during Hanukkah. They can be a bit labor-intensive, but the results are worth it. Invite a few friends over for a sufganiyot party—extra hands make light donut-making. Hanukkah can get hectic, but yours doesn’t have to be with a simple, adaptable Shabbat cake. You can toss it together in less than 15 minutes, as long as you remember to let the margarine soften ahead of time. Mix up the type of fruit and it can appear on your table again and again. Made with margarine instead of butter and chocolate, this easy chocolate mousse is both parve and vegan-friendly. Your guests will rave about the heavenly texture and deep, bittersweet chocolate flavor. 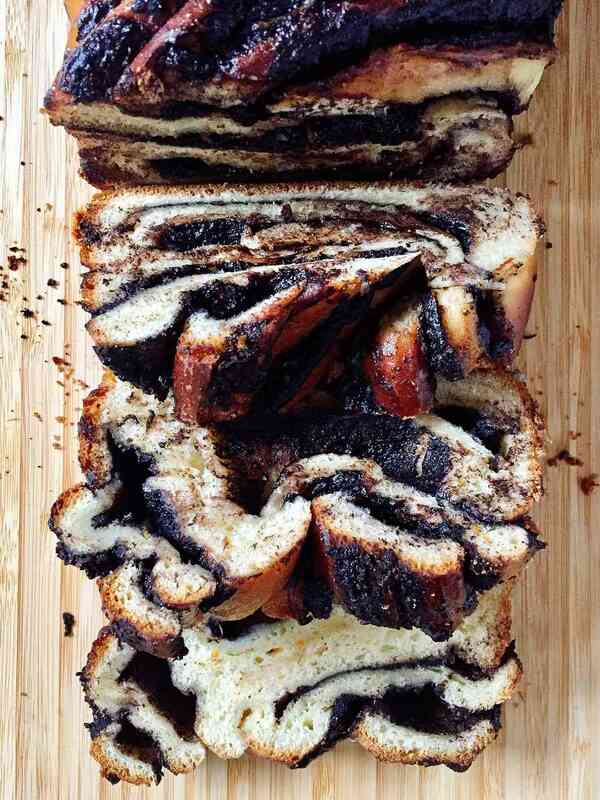 This luscious chocolate-laced babka will look and taste impressive on your Hanukkah table. A streusel topping gives the babka nice crunch and it’s baked in a loaf pan for easy transport if you need to bring a dish to pass. Everyone will enjoy this updated classic. Light, airy baked donuts are much less messy to make than the deep-fried version, although you will need a special donut pan. This recipe uses olive oil in both the batter and the topping, making it the perfect dessert for your Festival of Lights. If you prefer, you can also roll them in powdered sugar or dip in chocolate for a nice variation. Little helpers can pitch in on this simple Hamantaschen recipe, which lends itself to a wide variety of fillings. The crunchy cookie goes great with chocolate, minced nuts, jam, Nutella, or any combination you prefer. They are on the sweet side, so you might want to make miniature versions to avoid sugar overload. Get out the sanding sugar and prepare to fall in love with this easy, delicious holiday cookie. Since there’s no chilling required, this option is faster than many. Swap out the butter for margarine to make them parve, without sacrificing flavor or texture. Use olive oil in your Hanukkah menu in a new way with this elegant French cake. Lemon and olive oil give it a lovely citrus scent and delicate texture. Topped with strawberries, it’s a beautiful way to celebrate the Festival of Lights. While traditionally made with almonds, your family will love this variation on mandelbrot or “mandel bread.” The quick bake time will yield fairly soft cookies, so if you like yours more like the Italian biscotti, leave them in for closer to 15 to 20 minutes. Check them often to avoid burning the tops. Need a Hanukkah dessert that isn’t deep-fried? These gelt thumbprint cookies will help you cut down on the oil. Adding the chocolate coins before baking helps them stick better, but you’ll lose some of the detail on the picture. If you add them right after baking, they’ll look best, but can be a bit crumbly. This delightful thumbprint recipe also works with jam or other fillings once the holiday is over. Kids and kids-at-heart will love the dreidel shape baked right into the center of this classic butter pound cake. Decorate it with blue and silver candies for a festive touch and watch everyone’s faces as you cut into it. It’s sure to bring smiles to your family. Keep olive oil on your Hanukkah menu, but out of the fryer with this light lemon curd. It’s great on its own or as a filling for hamantaschen or crepes, or piped into sufganiyot if you decide to fry some up after all. And because it uses no butter, it’s kosher and parve. You won’t miss the butter in these parve sugar cookies that use olive oil instead. You can roll them in sprinkles and slice them for a quick and simple preparation, or get out the cookie cutters to make fun shapes. Give it time to chill in the refrigerator for at least an hour for the best texture. This creamy refreshing sorbet is the perfectly light ending to a rich brisket and latke dinner. Olive oil gives it a creamy texture and a little salt balances the tart lemon flavor nicely. Start with half a teaspoon and increase it from there, especially if you aren’t used to savory desserts.